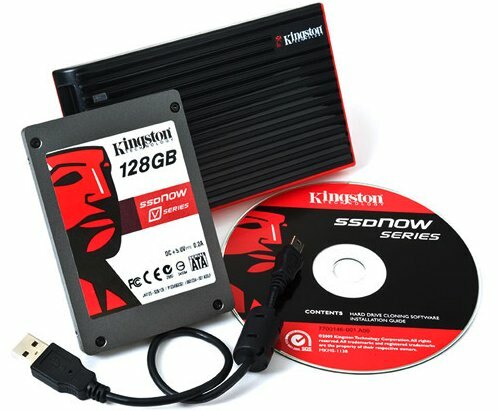 First up is the Kingston 128GB SSD V Series 2.5″ Hard Drive upgrade for $139.95 after a $75 mail in rebate. It’s actually part of a “notebook bundle” meaning it comes with an external drive caddy and USB cable to turn your existing 2.5″ internal hard drive into a portable external drive. If you get the 128GB SSD drive, don’t forget the $75 mail in rebate (PDF). The SSD rebate offer and price are valid until 2/14/2011. Next up is a Kingston Apple 8GB 1066MHz DDR3 RAM Upgrade, you’ll want to double-check that your machine handles the upgrade but it should be compatible with most new MacBook Pro’s, iMac, Mac Mini, and MacBook models. I used the same Kingston 8GB Ram Upgrade for my MacBook Pro and I’m thrilled with the results. If you’re a power user I would highly recommend 8GB of RAM, but it’s easy to check if your Mac needs a memory upgrade. I got the exact same SSD kit from Newegg not so cheap though! It’s a good little drive, not the fastest but way better than the stock HDD. Runs a little warm but no biggy. Also note that the external hard drive case and cable may look different than the one pictured. Also I don’t think the drive cloning software works for Mac, but it’s useful to have anyway. I got the RAM but it seems like it kills my battery faster. Not sure if anybody else is having that same issue. If so let me know. I wonder how I could take advantage of an SSD if I already have one in my laptop. Its a good deal so it makes me wonder. Anyhow..
« iPhone 5 Release Date to be June 5?